This is the ninth in a series of posts discussing The Amaz!ng Meeting 8, which took place at South Point Hotel and Casino in Las Vegas, Nevada, 8–11 July 2010. You can find the previous post here. You can find the next post here. I love Adam Savage—he's just one of those really cool people that I've been wanting to meet for years. I've never been the sort to attend conventions and the like, so I don't have many chances to hobnob with celebrities, but I've always felt that given the opportunity I would be perfectly capable of carrying on a normal conversation. Upon coming face to face with the fellow, however, I found myself unaccountably unable to put together a cogent sentence, much to my wife's amusement. A brief aside: it was my wife who, when we were first dating, actually introduced me to MythBusters (I'd never had cable) and thus to Adam Savage. (If I remember correctly, the first episode that we watched together was the one in which Jamie and Adam attempted to determine whether running one would end up wetter if one were to run through the rain rather than walking.) I now had the opportunity to reciprocate, and (after untying my tongue) I had the pleasure of introducing Adam Savage to her. Adam just has this effect on me, you know? He's one of those people up to whom I seriously look. (I hope that you'll excuse my absurd attempt to avoid ending that sentence with a preposition.) I try not to idolise people, but there are a few who are just such forces for good in the world that they make it truly difficult. This is why meeting Adam Savage, however briefly, was a major highlight of the conference for me. I'll never get to meet Richard Feynman or Carl Sagan, and that makes me sad, but Adam is in my mind a character of the same calibre: his excitement and enthusiasm for discovery is at once contagious and inspiring. The Winnipeg Skeptics will be hosting SkeptiCamp Winnipeg, Manitoba's first SkeptiCamp event, in October, and I will be presenting a talk tentatively titled "The Pleasure of Figuring Things Out". I have a feeling that Adam Savage will come up more than once. I think one of the defining moments of adulthood is the realization that nobody's going to take care of you. That you have to do the heavy lifting while you're here. And when you don't, well, you suffer the consequences. At least I have. (And in the empirical study I'm performing about interacting with the universe, I am unfortunately the only test subject I have complete access to, so my data is, as they say, self-selected.) While nobody's going to take care of us, it's incumbent upon us to take care of those around us. That's community. The fiction of continuity and stability that your parents have painted for you is totally necessary for a growing child. When you realize that it's not the way the world works, it's a chilling moment. It's supremely lonely. So I understand the desire for someone to be in charge. (As a side note, I believe that the need for conspiracy theories is similar to the need for God.) We'd all like our good and evil to be like it is in the movies: specific and horrible, easy to defeat. But it's not. It's banal. Then the Q&A session began. Adam dealt with the fellow with remarkable aplomb, and I say this not only because I obviously have quite the crush on him. "You sound quite hostile, so I'd say, 'Relax, what we do isn't science.' I'm biased by the fact that I know we were right in that episode, so you'll just have to take that." There was much laughter and applause. The Q&A spun off in several different discussions from there, mostly centring around nitpicks of various MythBusters episodes. 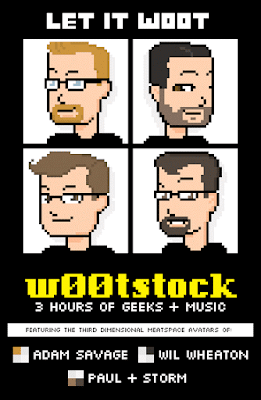 Adam mentioned w00tstock (which also featured Wil Wheaton, another really cool guy). For more information, head over to w00tstock's Wikipedia entry. Announcements! Brace yourselves: we get a contractually-guaranteed five more years of MythBusters! Not only that, but Adam and Jamie are also going to be producing more shows for Discovery. (Adam assures us that, unfortunately, he can't do anything about the Ghost Hunters). To wrap things up, the JREF auctions off a piece of the original duct tape bridge built for MythBusters. It's about six inches by six, and is signed by Adam and Jamie. After much running through the crowd showing it off, the piece sells for $650. If you're just dying for more Adam Savage (and honestly, why wouldn't you be? ), you can listen to him interviewed here for Geek a Week.